As an owner of the original HP MediaSmart Server EX470 one of the features I enjoy is the eSATA port being port multiplier aware. Once my EX470 became full I purchased the Sans Digital TR4M which gave me access to another 4 bays via the eSATA port. Unfortunately, the next gen MediaSmart Server (EX48x) as well as the Acer Aspire easyStore lacked this eSATA port multiplier feature. What this means is that if an eSATA enclosure like the TR4M is connected to the Acer/EX48x only one drive will be seen, rendering the enclosure useless. Fortunately there is hope for Acer owners. Using the eSATA PCI-X port multiplier card included with the TR4M Kam over at KamLau.com was able to successfully set up eSATA port multiplication on his Acer easyStore. For full details and a step by step guide head over to Kam’s excellent writeup here. I hate to disagree with the article, but I have the h340 and a tr2ut port multiplier box by sans digital (2 bay) and it worked right out of the box. Both drives are seen without a problem. No, it is an esata/usb enclosure having both connections. I have it currently hooked up with the esata cable anf both drives are seen perfectly through the onboard esata port. hmmm…interesting. I know other people who have tried the TR4M and not have it work, only 1 HDD shows. Thanks for pointing this out, hopefully we will get some more comments here confirming this. Thanks again. In another forum I misquoted the model number when talking about this same issue confusing the 2 bay with the 4 bay but I do not see why the 2 bay would be any different than the 4 bay. Some had no luck with 4 bay enclosures and others did not have a problem. Seems the pci-e card is easy enough to install though and will give you 2 additional esata ports. I heard that some esata enclosures support FIS based switching NOT command based switching. 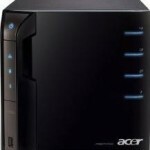 Here is a link that I have been following on Acer esata. So I guess the thing is to find out which format your esata enclosure supports. 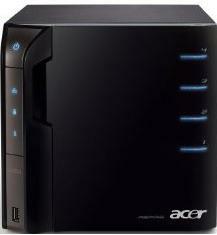 Do you know if anyone has successfully set up 2 Esata enclosures with the Acer (one running on the Esata port that comes with teh ACer and the second running on the PCI-X card)? I have not heard of this in my readings on the issue. I don’t see why it would be a problem. I wonder if the TR8MB can be used ? seeing that the PCI-x card has 2 esata ports and the TR8MB needs 2 esata connections to run. Hi Damian, thanks for mentioning my web site and linking to me. I really appreciate it. clc4912 is correct. I just tried plugging the TR4M to the e-SATA port on the Home Server and all the drives were recognized. I thought I read somewhere that the Acer easyStore does not support port multiplier from its e-SATA port but I guess it does. Thanks clc4912 for pointing that out. Great writeup Kam!!! So it looks like it is all dependent on the enclosure you get. The interesting thing, you should in theory then be able to get 2 functioning eSATA ports with port multiplication just as DieHard pointed out. So who is willing to try this out??? I know other people who have tried the TR4M and not have it work, only 1 HDD shows. If only one hdd appears then odds are they are using an eSATA connection that is not port multiplier aware, not all eSATA ports are. Next post: CableCard Coming To The Masses?